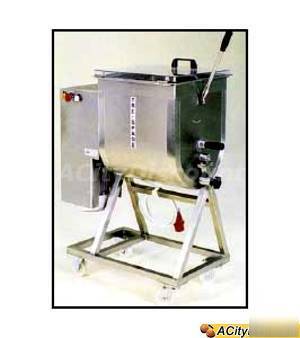 Full Line of Food Machinery Of America Products Available. Item: Food Machinery Of America, 110 Pound Capacity Electric Meat Mixer. Description: Machine conforms to CE requirements. Manufactured from AISI 304 stainless steel. Transparent tank cover. The tank can be turned 90Â° for easy emptying. Push button for temporary reverse rotation.